Luxury villas stand over turquoise waters, white sandy beaches lead to beautiful sea views, and traditional architecture meets modern flair; welcome to Olhuveli Beach & Spa Maldives. 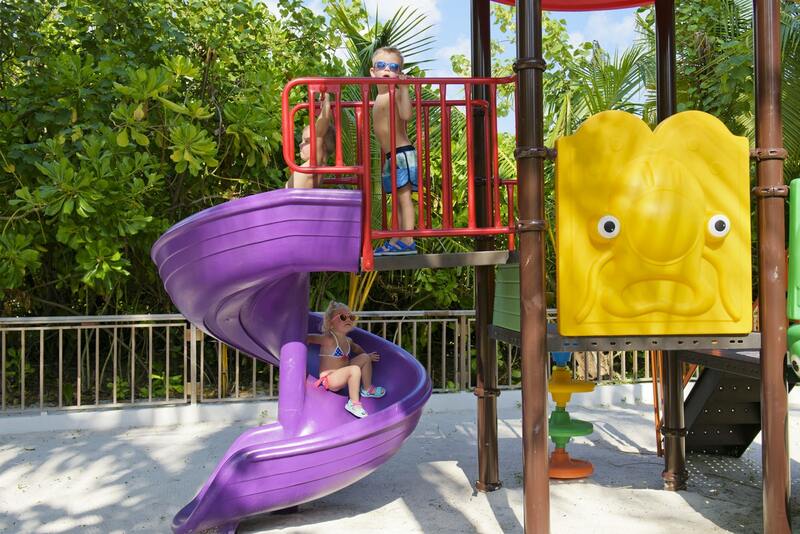 We invite you to join our little piece of paradise where life slows down and you can forget the outside world. 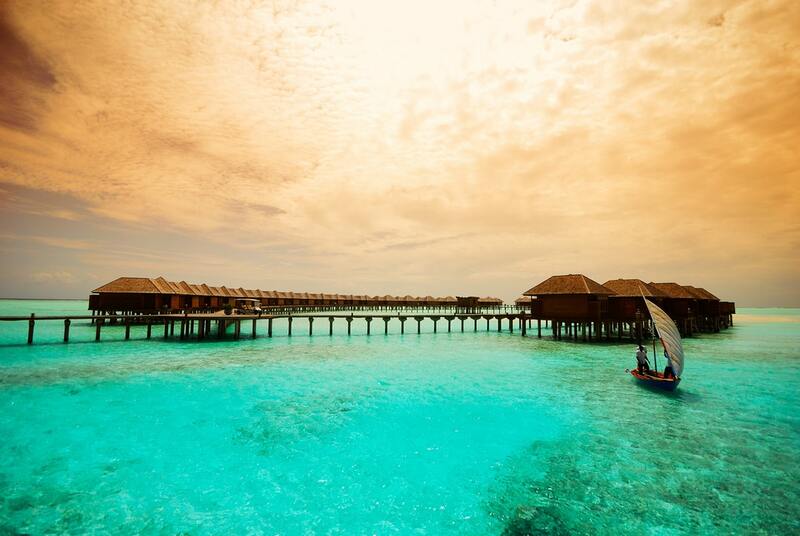 Your holiday in the Maldives is made for relaxing so sit back, put your feet up, and let us bring luxury to you. We have a range of activities and facilities on the island so be as active or as quiet as you want – this time is all yours. 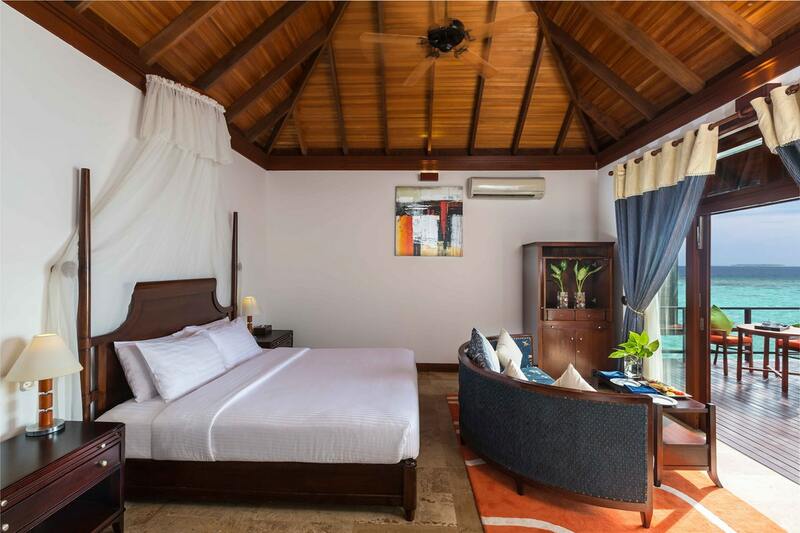 The stylish Maldivian luxury accommodation is beach fronted and comes with a terrace or balcony overlooking the picturesque beach and the lagoon. Each room is located in a two floor block of 2 individual rooms in each floor. Please see below for more information about our Deluxe Rooms. Spend your days in one of our most thoughtfully designed rooms. Spacious interiors, private outdoor bathrooms, and stunning views of the Indian Ocean create the quintessential Maldives getaway. Spanning out for 2 floors, with 2 rooms in each floor – these airy rooms offers panoramic ocean views and glimpses of our manicured gardens. The airy atmosphere extends into the open air bathroom with twin vanities and a bathtub. Out the large windows and from the lanai, capture vivid views of the Indian Ocean. 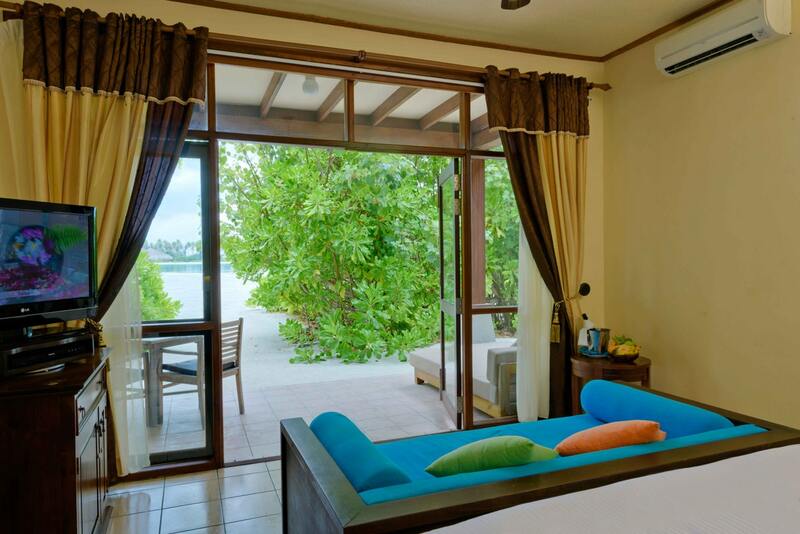 With spacious interiors and multiple daybeds it is the perfect venue for a Maldives vacation. While inside the thoughtful amenities and the calming interiors will create a quiet and private hideaway. The lovely Maldivian style water villas are perched over the clear blue lagoon with inspiring views over the Indian Ocean. 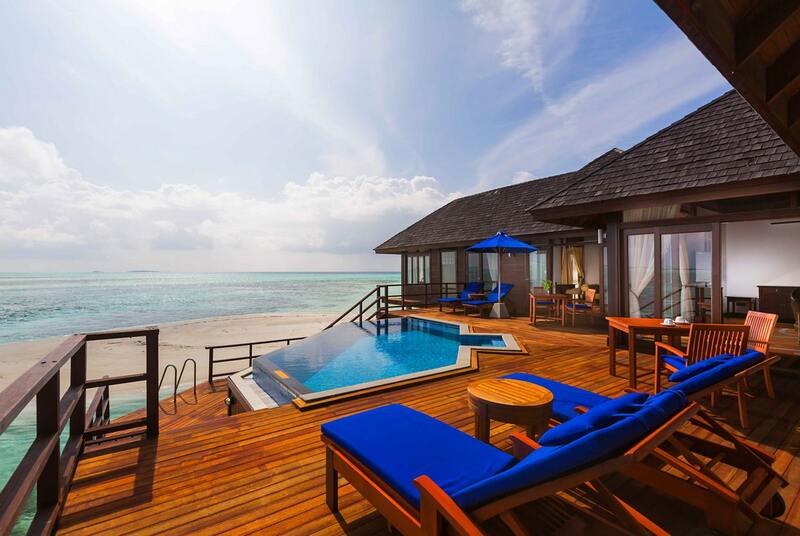 Your private sun deck with sun loungers lead directly into the warm lagoon; a refreshing swim is just steps away. Please see below for information about our Deluxe Water Villas. 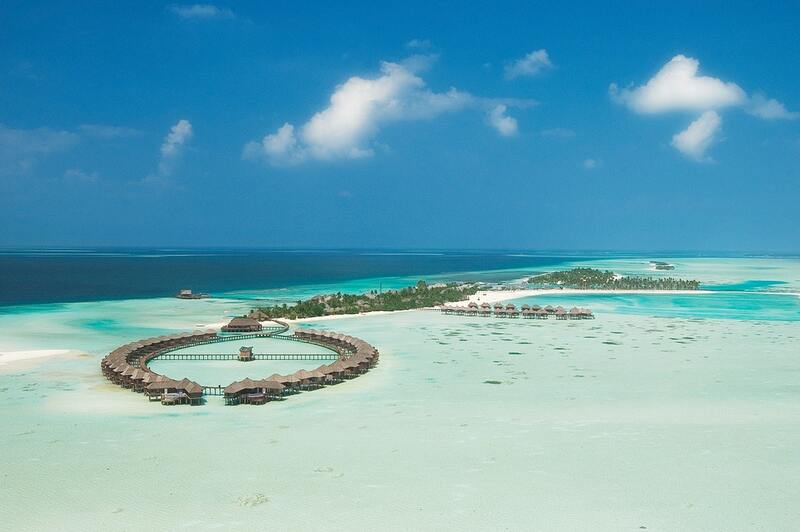 Step out and indulge in the natural beauty of the Maldives in our luxurious Presidential Water Suites. Situated at the far end of the water villa jetty where the two footbridges meet, each suite offers complete privacy and an unparalleled view of the Indian Ocean. The Presidential Suites feature two tastefully decorated bedrooms with private wooden sun deck, an open plan living and dining area complete with flat screen TV, surround sound, and DVD player, and a kitchenette. One of the largest overwater restaurants in the Maldives, our main restaurant is open daily for breakfast and dinner with an emphasis on both local and international flavours. From succulent prawns flavoured with fresh spices to outstanding wines, the open-sided design means that every meal comes with an exquisite view. As well as buffet-style dining, one of the highlights of our overwater dining experience is the live cooking stations where you can watch our chefs expertly create dishes from around the world in front of you. The extensive open deck also gives the choice to sit under the stars for an alfresco dinner. Please see below for more details about our Sunset Restaurant. 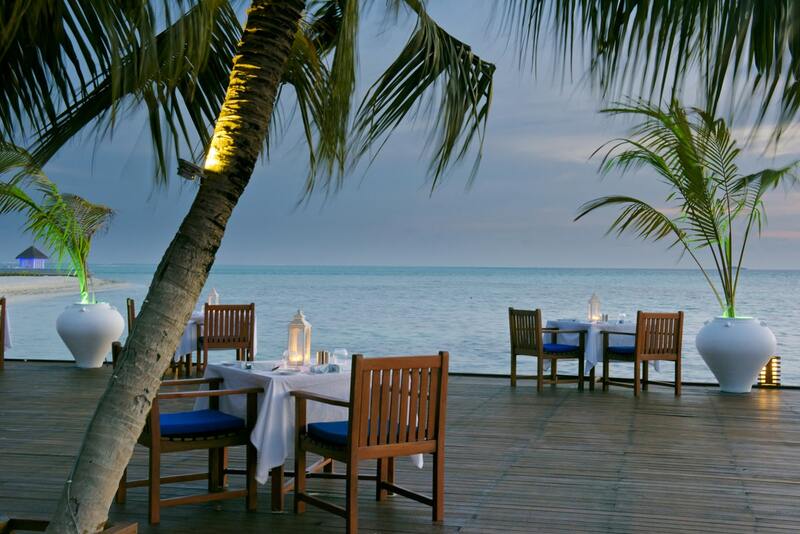 For guests who find getting away from the Maldives beach impossible, our Lagoon restaurant sits right on the beach with ample open decking and overlooks the beautiful lagoon. As well as being the main setting for lunch, it makes an informal but enjoyable place to have a delicious dinner and talk long into the night. Please see below for more details about our Lagoon Restaurant. 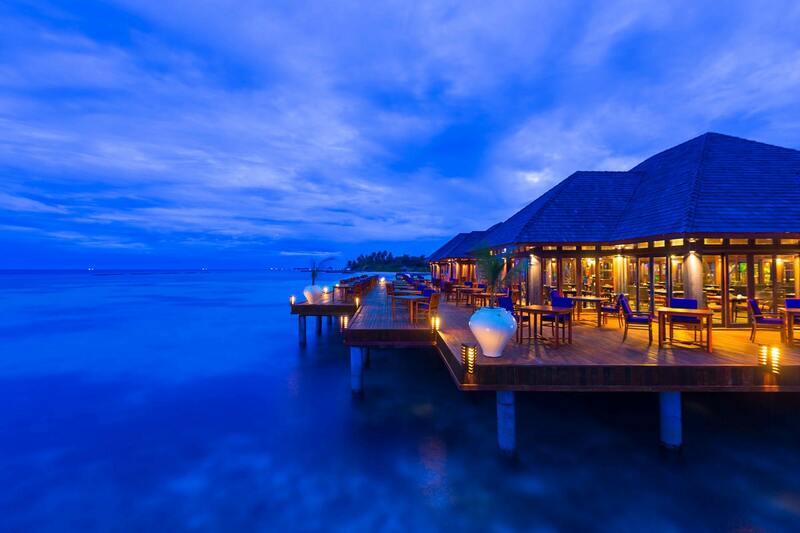 Open every evening for dinner, the overwater setting of The Four Spices is perfect for fine à la carte dining and ideal to celebrate a special occasion. 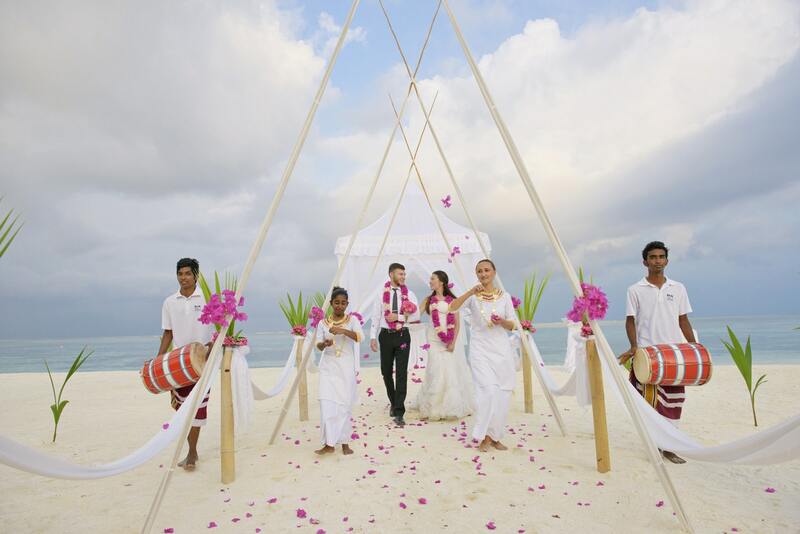 The Olhuveli Beach & Spa Resort team is on hand to guide you through the bespoke menu and match wines with your dishes. This is Asian food at its finest with highlights of Japanese, Indian, Thai, and Maldivian flavours. Indoor or outdoor seating is available. Find the perfect spot from the stretch of private beach under the stars, at the poolside, or in the privacy of your villa. A light lunch of Maldivian fish on your terrace, champagne and canapés while watching a sunset from your Water Villa, a private BBQ of fine cuts on your private sandbank - the possibilities are endless and the choice is yours. 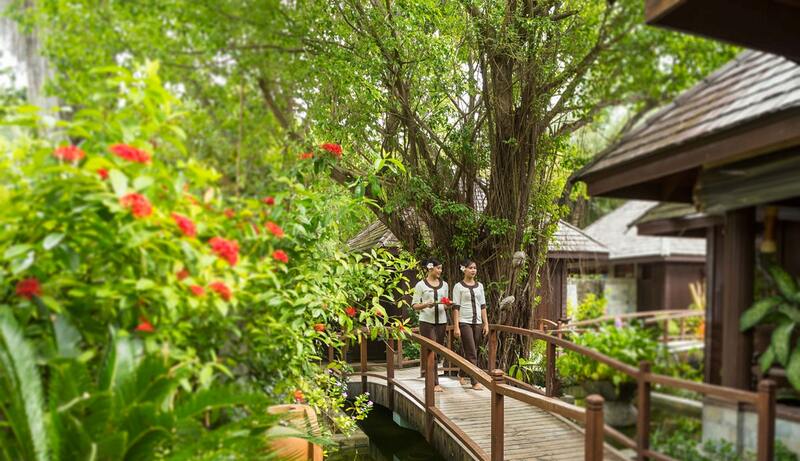 All of our destination and in-villa meals are served with discretion to give you privacy. Pre-arrangements to surprise your loved ones can be organized in consultation with the Guest Relations Team, click here to get in touch with them today. The Sun Spa Maldives has one ideal at its heart – to take a holistic approach to health and wellbeing using ancient Indian Ayurvedic techniques while encompassing the five elements. With hydrotherapy pools, signature products, a steam room, sauna, jacuzzi, hair and beauty salon, and peaceful relaxation areas, the main centre is a delightful place to relax in. 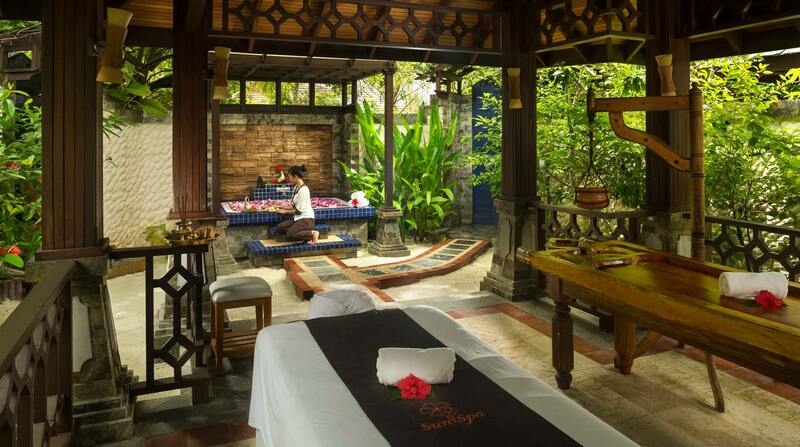 Hidden away in the vegetation and connected by a series of intricate bridges are eight secluded and private Spa Pavilions used for treatments, all of which feature a courtyard garden, twin massage beds, a rain shower, and an outdoor flower bath.